It’s bound to be a slow news week, slow blogging week, etc. so I’m going to take this opportunity to blog all week on First Freedom First, a group that advocates for support of Americans’ Constitutional right to religious liberty as guaranteed by the First Amendment. On my sidebar there’s a link to the FFF website, which indicates eight battlegrounds, yes, battlegrounds, in the struggle for First Amendment freedoms. 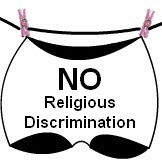 Today: No Religious Discrimination. It amazes and saddens me, as one who is inspired and indeed devoted to Jesus, that we have to fight fellow “Christians” (and I use the quotes for myself as well as others) to stop religious discrimination in America. Christians who blandly deny equal rights and opportunities for non-Christians, and today that means Muslims above all, have no sense of the history of their own religion, either in this country alone, or perhaps more importantly in the time of Jesus himself. The Puritans and many who came to the United States afterwards came in search of the freedom to practice their religion freely. That is an incontrovertible fact. And Jesus. Jesus. No, not using his name in vain, just with a sigh. Nailed to the cross, executed in cold blood, because he spoke the truth to the secular AND religious majority of his day. Aggressive attempts to make the human power structure conform to the Jesus/Christian worldview? How did that work out for you, Judas Iscariot? Not only is he born into an oppressed people, and forced out of his parent’s city, and excluded from the common shelterÂ—now the oppressed person, the homeless person, the excluded person must become a fugitive, driven farther away from the familiar, the comfortable, into an exile that recalls the wandering of the whole Jewish people. Herod the persecutor takes up the role formerly played by Pharaoh, the men of power trying to stamp out God’s chosen instrumentÂ—first his People, then his Son. The relationship of Jesus to worldly power is revealed from the very outset of his life. He is the rulers’ prey, on the run from them down through the ages. Oh. So I win a little Weblog Award and then YOU go ahead and get named Time Magazine’s person of the year. You always have to go the extra mile, doncha, punk? Well congratu-toody-lations to you.